MATTHEW McISAAC has landed the best summer job of his life. Not only is the fourth-year biology student being paid to do research, he is the lead researcher, he works in his area of interest, sets his own hours and works outside. His findings could create change on campus, in Kamloops and around the world. He expects to present his findings at a conference and experts and influencers he wouldn’t have otherwise. And because this summer job meshes with his courses, he won’t have to re-orient his brain when classes resume in September. 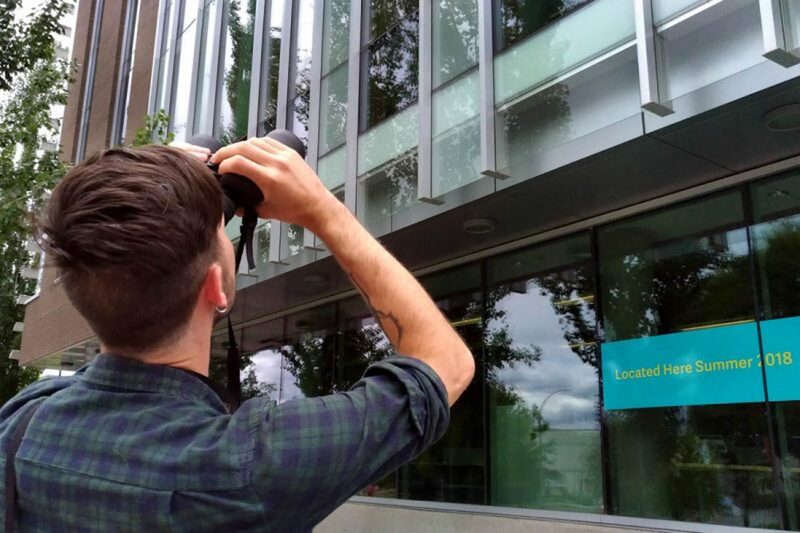 McIsaac is looking into the frequency that birds crash into TRU’s windows—referred to as bird-window collisions—and what preventative measures can be using for buildings whether they are still in the planning stages or longstanding. Although McIsaac’s area of interest is molecular plant biology, he also enjoys diving into unfamiliar territory and searching for and finding answers. So for him, the bird research is a terrific fit. The study is an initiative of the Environmental Advisory Committee (EAC) and is being funded by the TRU Sustainability Grant Fund. McIsaac learned of the opportunity through Tom Dickinson, EAC member and TRU’s dean of science. McIsaac is collecting and generating data, including reports of dead birds from TRU’s grounds crew. He walks around campus photographing windows, analyzing them for signs birds have struck the windows, such as smudges and marks. For high windows, he uses binoculars. Found a dead bird on campus? Everyone can play a part in McIsaac’s efforts to find a solution by reporting dead birds to mcisaacm11@mytru.ca. Be sure to include a description of the location where the bird was found and if possible, a photo or two. It also helps if photos or the bird’s locations are geotagged through a GPS location, doable with Google Maps. Anecdotal evidence of a collision is welcome as well. Birds hit windows for many reasons. The glass reflects trees and open sky so birds believe they have a clear path. Or it looks like they can fly through an open space in the building. Or, because of how their eyes work, they can’t see glass at all. Solutions range from simply putting stickers on windows to installing windows that birds can see. Window collisions rank second behind cats for human-caused bird mortality in North America. Third is human impact on their habitat such as the removal of trees, development, re-configuring of land and paving. Large North American cities like Toronto, Chicago and New York have created remediation strategies, while it’s estimated that between 300,000 and one billion birds die each year in North America from window collisions. Though many birds avoid crashing by flying up at the last second, those who are hurt or die can be safety and health risks. They can attract unwanted scavengers and predators from insects and worms to carrion birds like crows and magpies to larger mammals like coyotes and bears. “I think we have a responsibility to do something about this because we’re responsible for changing the environment,” said McIsaac. “As we lose birds, we lose biodiversity and the loss of biodiversity leads to a lot of damage across the entire planetary ecosystem. “There is an argument to be made for not mitigating the harm to birds, but I don’t think it’s a very strong one. As humans evolve and take over this habitat, this is part of the evolutionary process and birds are being winnowed out that can’t handle humans. Great study! I’m glad that you are taking it on and hopefully it will lead to new measures to protect birds .I will disagree with your statement about it being more interesting listening to song birds than crows.If you spend some time in the “Outback” you will start to realize that the Corbids seem to actually have a language and are able to convey real messages to other Corbids and to other animals, including the human ones, in the vacinity and to teach what they learn to others as well.The range of sounds is quite amazing and is well worth a study of it’s own.